Allianz - Global insurer and provider of financial services. America's Corporate Finance Directory - From Lexis-Nexis. Also useful for identification of other outside service providers, including auditor, banker, pension manager, insurance carriers, investment banker. American Express - Small business, merchant, corporate, and individual credit card, shopping, and travel programs and solutions. American Monetary Institute (AMI) - Researching monetary reform that will bring forth a greater level of economic justice and a more equitable and efficient functioning of government. American Numismatic Association (ANA) - Operates under a Federal charter in the U.S., to advance and promote the study of coins, paper money, tokens, medals and related numismatic items as a means of recording world history, art, economic development and social changes, and to promote greater popular interest in the field of numismatics. American Progress: Economy - A basic guide to all your questions about the economic downturn and the recovery and reinvestment plans in Congress from the Center for American Progress. Bank Systems and Technology - Information on the strategic use of technology for increased productivity and profitability in banking. BenefitWallet - An HSA administrator. Baseline Scenario, The - Background material, resources and news on global financial crisis. A rate change from 5% to 6%, reflects a change of 1 percentage point or 100 basis points. A rate change from 6.7% to 6.9% reflects a change of 0.2 of a percentage point or 20 basis points. A rate change from 2.75% to 3.20% reflects a change of 0.45 of a percentage point or 45 basis points. A basis point could also be considered as one percent of one percent which is 1/100 x 1/100 = 1/10,000. Better Markets - A nonprofit, nonpartisan organization that promotes the public interest in financial reform in the domestic and global capital and commodity markets. Bitcoin - Find what you need to know and get started with Bitcoin here. BITS - A division of The Financial Services Roundtable, BITS is a non-profit industry consortium whose members are 100 of the largest financial institutions in the United States. Created in 1996 by the CEOs of these institutions, BITS fosters the growth and development of electronic financial services and e-commerce for the benefit of financial institutions and their customers. Bogle Financial Markets Research Center - Support Vanguard founder John C. Bogle's ongoing work on behalf of investors. Since he stepped down as Chief Executive Officer of The Vanguard Group in 1996, Bogle has been studying, writing, and speaking about issues related to the financial markets and mutual funds. Also see Speeches by John C. Bogle. BPubs - Finance and accounting business publications. BusinessFinance - Provides up to date content to obtain capital, gain support, find government programs, gett expert advice, and more. Center for Financial Reasearch and Analysis (CFRA) - A leading independent financial research organization whose mission is to warn investors and creditors about companies experiencing operational problems and particularly those that employ unusual or aggressive accounting practices to camouflage such problems. CFPB Consumer Complaint Database - Each week the Consumer Financial Protection Bureau (CFPB) sends thousands of consumers' complaints about financial products and services to companies for response. Those complaints are published here after the company responds or after 15 days, whichever comes first. By adding their voice, consumers help improve the financial marketplace. Charles Schwab - A full-service financial services company, offering investment guidance, trading and brokerage services, and a full range of investment and financial products. Committee on Financial Services, House of Representatives - Has jurisdiction over all issues pertaining to the economy, the banking system, housing, insurance, and securities and exchanges. Additionally, the Committee has jurisdiction over monetary policy, international finance, international monetary organizations, and efforts to combat terrorist financing. Committee on Foreign Investment in the United States (CFIUS) - An inter-agency committee authorized to review transactions that could result in control of a U.S. business by a foreign person ('covered transactions'), in order to determine the effect of such transactions on the national security of the United States. Compliance Headquarters - Dedicated to providing reliable, convenient and understandable regulatory compliance information and solutions to the financial services industry. Consumer & Economic Development Research & Information Center (CEDRIC) - The Federal Reserve Bank of Chicago fosters research related to consumer and economic development issues such as consumer and small business financial behavior, access to credit, affordable housing, and community development and reinvestment. Consumer Financial Protection Bureau (CFPB) - The central mission of the CFPB is to make markets for consumer financial products and services work for Americans - whether they are applying for a mortgage, choosing among credit cards, or using any number of other consumer financial products. CreditSights - Work spans loan research, structured credit products, and sector strategy among others. Complementing its sector work is macro level strategy on issues such as pensions, covenants, mergers & acquisitions, and leveraged buyouts. Its micro and company-level research coverage in both the US and Europe includes telecom, media, and technology as well as various energy-related sectors across utilities, power, and oil and gas. CreditSights covers a full credit spectrum of industrials including automotive and manufacturing, commodity-based cyclicals, homebuilding, retail, consumer products, aerospace and defense, and the airlines. Its seasoned senior financial services analytical team covers US and European brokerage and bank issuers, insurance companies, REITs, monolines, and government-sponsored enterprises. CreditSights regularly writes about over 700 companies. Our easily-searched archives contain over 60,000 articles. Crowdsourcing - Source for crowdsourcing and crowdfunding information, insight and research. DALBAR - The only rating service for financial professionals in the U.S. DALBAR's mission is to raise standards of excellence in financial services by measuring, comparing and communicating about excellence where it is found. Dealogic - Widely respected for the accuracy of its data, Dealogic regularly appears in the international press providing figures covering all aspects of corporate finance and capital markets. Economy - Moody's Economy.com, a division of Moody's Analytics, is a leading independent provider of economic analysis, data, and forecasting and credit risk services. Its worldwide client base includes the largest commercial and investment banks, insurance companies, financial services firms, mutual funds, governments at all levels, regulators, manufacturers, utilities, and industrial and technology companies. EDGAR Database - The Electronic Data Gathering, Analysis, and Retrieval system performs automated collection, validation, indexing, acceptance, and forwarding of submissions by companies and others who are required by law to file forms with the U.S. Securities and Exchange Commission (SEC). EDGAR Online - Search over 15 million SEC Edgar documents by ticker, company name, form type or keyword. Emergency Economic Stabilization Act and Troubled Asset Relief (TARP) - Comprehensive sites of data, informaion and resources covering all areas of the Emergency Economic Stanilization Act and Troubled Asset Relief (TARP) initiatives by the United States Treasury. ESMA Central Repository (CEREP) - ESMA has set up a central repository (CEREP) for publishing the rating activity statistics and rating performance statistics of credit rating agencies. The CEREP allows users to search, filter, download and print statistics for individual CRAs for time periods of varying length and different rating types. European Financial Services Roundtable (EFR) - Industry voice on European poicly issues relating to financial services. European Stability Mechanism (ESM) - Wikipedia article: A proposed international organisation which, if established, will provide financial assistance to members of the eurozone in financial difficulty. The ESM is intended to replace existing temporary funding programmes the European Financial Stability Facility (EFSF) and the European Financial Stabilisation Mechanism (EFSM). It is proposed to locate the ESM in Luxembourg. Also see European Fisxcal Compact. Export Credit Agencies (ECA) - Policy analysis, case study research and news stories about the social and developmental impacts of Export Credit Agencies and Investment Insurance Agencies (ECAs). ECAs are public agencies that provide government-backed loans, guarantees and insurance to corporations from their home country that seek to do business overseas in developing countries and emerging markets. Factoring - A financial transaction whereby a business sells its accounts receivable (i.e., invoices) to a third party (called a factor) at a discount. Federal Housing Finance Agency (FHFA) - Created on July 30, 2008, when the President signed into law the Housing and Economic Recovery Act of 2008. The Act gave FHFA the authorities necessary to oversee vital components of US secondary mortgage markets - Fannie Mae, Freddie Mac, and the Federal Home Loan Banks. In addition, this law combined the staffs of the Office of Federal Housing Enterprise Oversight (OFHEO), the Federal Housing Finance Board (FHFB), and the GSE mission office at the Department of Housing and Urban Development (HUD). Federal Reserve Archival System for Economic Research (FRASER) - This collections includes documents pertaining to historical banking law and legislation from a wide variety of sources. The materials are primarily from the first 25 years of the Federal Reserve System. Federal Reserve System - he central bank of the United States. It was created by the Congress to provide the nation with a safer, more flexible, and more stable monetary and financial system. The Federal Reserve was created on December 23, 1913, when President Woodrow Wilson signed the Federal Reserve Act into law. Today, the Federal Reserve's responsibilities fall into four general areas. 1) Conducting the nation's monetary policy by influencing money and credit conditions in the economy in pursuit of full employment and stable prices. 2) Supervising and regulating banks and other important financial institutions to ensure the safety and soundness of the nation's banking and financial system and to protect the credit rights of consumers. 3) Maintaining the stability of the financial system and containing systemic risk that may arise in financial markets. 4) Providing certain financial services to the U.S. government, U.S. financial institutions, and foreign official institutions, and playing a major role in operating and overseeing the nation's payments systems. Also see 100 Years: Gateway to the History of the Federal Reserve System. Fidelity Investments - Provides services in three major areas: brokerage services, mutual funds and retirement plans direct to individual investors; retirement services for 401(k), 403(b) and 457 plans available through employers; financial intermediaries investment services such as banks, insurance companies and broker dealers. Financial Accounting Standards Board - Establishes and improves standards of financial accounting and reporting for the guidance and education of the public, including issuers, auditors, and users of financial information. Financial-Conferences - Large database of financial courses and conferences. Financial Crisis Inquiry Commission (FCIC) - In the wake of the most significant financial crisis since the Great Depression, the President signed into law on May 20, 2009, the Fraud Enforcement and Recovery Act of 2009, creating the Financial Crisis Inquiry Commission. The Commission was established to "examine the causes, domestic and global, of the current financial and economic crisis in the United States." The 10 members of the bi-partisan Commission, prominent private citizens with significant experience in banking, market regulation, taxation, finance, economics, housing, and consumer protection, were appointed by Congress on July 15, 2009. The Chair, Phil Angelides, and Vice Chair, Bill Thomas, were selected jointly by the House and Senate Majority and Minority Leadership. You can obtain the Commission's report at CyberCemetary. Financial Industry Regulatory Authority (FINRA) - An independent, not-for-profit organization authorized by Congress to protect America's investors by making sure the securities industry operates fairly and honestly. It is a non-governmental organization that regulates member brokerage firms and exchange markets. The government agency which acts as the ultimate regulator of the securities industry, including FINRA, is the Securities and Exchange Commission. Also see Wikipedia. Financial Services Agency (FSA-Japan) - Japanese government agency and an integrated financial regulator responsible for overseeing banking, securities and exchange, and insurance sectors in order to ensure the stability of the financial system of Japan. Financial Services Authority (FSA-UK) - An independent non-governmental body, given statutory powers by the UK's Financial Services and Markets Act 2000. It is a company limited by guarantee and financed by the financial services industry. An area of this website provides information specifically for consumers on financial products, regulation and their rights. Financial Services Roundtable - A forum in which leaders of the United States financial services industry determine and influence public policy issues and promote the interests of member companies in federal legislative, regulatory and judicial forums. Financial Management Service (FMS) - The U.S. Government's financial manager, central disburser, and collections agent as well as its accountant and reporter of financial information. The FSA has also published "The Turner Review", a wide-ranging review of global banking regulation. The Review identifies three underlying causes of the crisis - macro-economic imbalances, financial innovation of little social value and important deficiencies in key bank capital and liquidity regulations. These were underpinned by an exaggerated faith in rational and self-correcting markets. It stresses the importance of regulation and supervision being based on a system-wide "macro-prudential" approach rather than focussing solely on specific firms. Financial Scandals - Frauds, scams and scandals in banking, finance, and related areas. Financial Stability Oversight Council (FSOC) - Established under the Dodd-Frank Act, the FSOC will provide, for the first time, comprehensive monitoring to ensure the stability of our nation's financial system. The Council is charged with identifying threats to the financial stability of the United States; promoting market discipline; and responding to emerging risks to the stability of the United States financial system. The Council consists of 10 voting members and 5 nonvoting members and brings together the expertise of federal financial regulators, state regulators, and an insurance expert appointed by the President. Financial Times (FT.com) - Financial news and information worldwide. FinancialStability.gov - Offical site promising transparency on a comprehensive plan to restore stability to the U.S. financial system known as the Financial Stability Plan. This site will be the starting point for transparency of all financial stability resources and sources being developed and implemented by the United States Government Department of Treasury. FINRA - Operates the largest dispute resolution forum in the securities industry to assist in the resolution of monetary and business disputes between and among investors, securities firms and individual registered representatives. FinWeb - Economics and finance-related topics. Fortune 500 - Prepared at the direction of Fortune editors. German Hyperinflation, 1923 - Excerpt from Paper Money by Adam Smith [George J.W. Goodman], pp. 57-62. In the mid-1960s, money manager George J.W. Goodman began to write a series of irreverent and witty columns for New York magazine under the borrowed name of capitalism's founding theorist, Adam Smith. 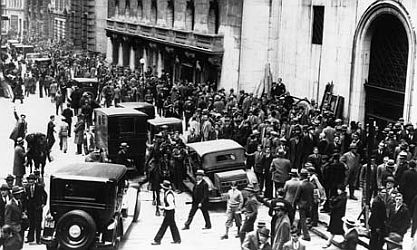 As Adam Smith," Goodman went on to write several bestsellers about economics, the stock market, and global capitalism, among them The Money Game, Supermoney, and Paper Money, from which this account of the Weimar Republic's disastrous hyperinflation is excerpted. Global Financial Integrity (GFI) - Promotes national and multilateral policies, safeguards, and agreements aimed at curtailing the cross-border flow of illegal money. Global Initiative for Fiscal Transparency (GIFT) - A multi-stakeholder action network working to advance and institutionalize global norms and significant, continuous improvements on fiscal transparency, participation, and accountability in countries around the world. GLOBUS & NTDB - Links are provided on this page to sources which were used for GLOBUS & NTDB. Green Sheet, The - Financial services news, books, and resources. Greenwich Associates - Consulting and research in institutional financial services. Halifax Initiative - Canadian organization for public interest advocacy and education on international financial institutional reform. Hartford, The - Insurance and financial service products. Her Majesty's Treasury (UK) - The Treasury is the United Kingdom's economics and finance ministry. It is responsible for formulating and implementing the Government's financial and economic policy. History of Money - Monetary history in context from the dawn of civilization to the beginning of the twenty first century. House Committee on Financial Services - The Committee oversees the entire financial services industry, including the securities, insurance, banking, and housing industries. Also oversees the work of the Federal Reserve, the Treasury, the SEC, and other financial services regulators. Individual Finance and Insurance Decisions Centre (IFID) - A non-profit corporation dedicated to generating advanced research at the intersection of wealth management, personal finance and insurance. Located within the prestigious Fields Institute on the campus of the University of Toronto, the IFID Centre represents a growing network of affiliated researchers and associates that have helped numerous companies in the financial services sector, as well as government agencies, and individuals around the world. Also see Personal Finance Articles and Research Papers. Initiative on Global Markets - Supports original research on international business, financial markets and public policies. International Budget Partnership (IBP) - IBP was formed within the Center on Budget and Policy Priorities to collaborate with civil society organizations in developing countries to analyze, monitor, and influence government budget processes, institutions, and outcomes. The aim of the Partnership is to make budget systems more responsive to the needs of poor and low-income people in society and, accordingly, to make these systems more transparent and accountable to the public. Invesco - With $423.1 billion in assets under management (as of December 31, 2009), Invesco is a leading independent global investment management company. J.P. Morgan - Advises on corporate strategy and structure, raises capital, makes markets in financial instruments, and manages investment assets. Lehman Brothers Holdings Inc. Chapter 11 Proceedings Examiner's Report - The Examiner's report is divided into nine volumes, which are reproduced in individual PDF files. Lincoln Financial Group - A leading manager and provider of individual annuities, life insurance, 401(k) plans, life-health reinsurance, institutional investment management and mutual funds. Macroprudential Regulation - The term macroprudential regulation characterizes the approach to financial regulation aimed to mitigate the risk of the financial system as a whole (or "systemic risk"). In the aftermath of the late-2000s financial crisis, there is a growing consensus among policymakers and economic researchers about the need to re-orient the regulatory framework towards a macroprudential perspective. A Wikipedia backgrounder. Making Home Affordable - Eligible borrowers who are current on their mortgages but have been unable to take advantage of today's lower interest rates because their homes have decreased in value, may now have the opportunity to refinance. Through the Home Affordable Refinance Program, Fannie Mae and Freddie Mac will allow the refinancing of mortgage loans that they own or that they placed in mortgage backed securities. Use the self-assessment tools provided on this U.S. government website to see if you are among the 7 to 9 million homeowners who may be able to benefit from Making Home Affordable. Manulife Financial - A leading Canadian-based financial services company operating in 19 countries and territories worldwide. Through its extensive network of employees, agents and distribution partners, Manulife Financial offers clients a diverse range of financial protection products and wealth management services. John Hancock is owned by Manulife Financial. Mincome - An experimental Canadian basic income project that was held in Dauphin, Manitoba during the 1970s. The project, funded jointly by the Manitoba provincial government and the Canadian federal government, began with a news release on February 22, 1974, and was closed down in 1979. The purpose of this experiment was to determine whether a guaranteed, unconditional annual income caused disincentive to work for the recipients, and how great such a disincentive would be. Moshe Milevsky - Moshe is the Executive Director of the IFID Centre and is an Associate Professor of Finance at the Schulich School of Business at York University in Toronto, Canada. Moshe's expertise is on the interplay between financial risk management and personal wealth management. In addition to teaching he also works as a consultant for a variety of financial services companies and pension funds. He has been interviewed by Business Week, The Wall Street Journal, The New York Times, Barron's, Fortune and Money Magazine. Moshe has published over 40 scholarly research articles, is the founding co-editor of the Journal of Pension Economics and Finance, and is the author of the 1999 Canadian best seller Money Logic: Financial Strategies for the Smart Investor (Stoddart Press). MSCI - Risk management, corporate governance and financial research & analysis. NAICS/SIC Codes - NAICS/SIC search engine. Neighborhood Assistance Corporation of America (NACA) - A non-profit community advocacy and HUD certified counseling agency. NACA has been in the forefront of fighting discriminatory and predatory lending for over 20 years. NACA provides the most affordable mortgage solution for both homebuyers and homeowners. Started in 1988, NACA has a tremendous track record of successful advocacy against predatory and discriminatory lenders as well as providing the best mortgage program in America with $10 billion in funding commitments. NACA is the largest housing services organization in the country and is rapidly expanding by growing its existing 30+ offices, headquartered in Boston, MA, opening many new offices nationwide, and expanding the services it offers its membership. NACA's confrontational community organizing and unprecedented mortgage program have set the national standard for assisting low- and moderate-income people to achieve the dream of homeownership. Nouriel Roubini's Global EconoMonitor - This blog tracks monetary issues, among others, through a macroeconomic lens. It offers the views of Nouriel Roubini. Entries take a global view on currency swings and appear every few days. Open Budget Survey - A global research and advocacy program to promote public access to budget information and the adoption of accountable budget systems. IBP launched the Initiative with the Open Budget Survey - a comprehensive analysis and survey that evaluates whether governments give the public access to budget information and opportunities to participate in the budget process at the national level. The IBP works with civil society partners in 85 countries to collect the data for the Survey. Open Secrets. org - Tracks money in politics and its effect on elections and public policy. Overseas Private Investment Corporation (OPIC) - U.S. Government agency that sells investment services to U.S. companies investing in 140 emerging economies around the world. Paul Woolley Centre for the Study of Capital Market Dysfunctionality - Produces and disseminates research relating to the understanding the workings of capital markets and the social efficiency of allocations achieved in these markets. Payoff Pilot - Hub for consumers with debt to find helpful personal finance resources and solutions. Also see Financial Literacy Resources page. Piper Jaffray - Financial advisor, investment research. Prime Rate - The Prime Rate is the interest rate charged by banks to their most creditworthy customers (usually the most prominent and stable business customers). The rate is almost always the same amongst major banks. Adjustments to the prime rate are made by banks at the same time; although, the prime rate does not adjust on any regular basis. The rates reported here are based upon the prime rates on the first day of each respective month over a 10-year period. Principal Financial Group, The - A diversified family of insurance and financial services companies. Promontory Financial Group - A leading strategy, risk management and regulatory compliance consulting firm focusing primarily on the financial services industry. The consulting firm is filled with so many former bureaucrats and political insiders that it has become known as Wall Street's shadow regulator. Public Debt Online: FAQs About the Public Debt - FAQs asked and answered the the U.S. Bureau of the Public Debt. Recovery.gov - Recovery.gov is the U.S. government's official website that provides easy access to data related to Recovery Act spending and allows for the reporting of potential fraud, waste, and abuse. Reforming the International Monetary System - Follow the efforts of policymakers, academics, and other experts here as they debate and discuss reform proposals and work to build a more stable international monetary system. Research on Money and Finance (RMF) - A network of political economists that have a track record in researching money and finance. It aims to generate analytical work on the development of the monetary and the financial system in recent years. A further aim is to produce synthetic work on the transformation of the capitalist economy, the rise of financialisation and the resulting intensification of crises. Rhodium Group (RHG) - Combines policy experience, quantitative economic tools and on-the-ground research to analyze disruptive global trends. Its work supports the investment management, strategic planning and policy needs of clients in the financial, corporate and government sectors. Sarbanes-Oxley Act of 2002 - Also known as the Public Company Accounting Reform and Investor Protection Act of 2002 and commonly called SOX or Sarbox. It is a United States federal law enacted on July 30, 2002 in response to a number of major corporate and accounting scandals including those affecting Enron, Tyco International, Adelphia, Peregrine Systems and WorldCom. These scandals, which cost investors billions of dollars when the share prices of the affected companies collapsed, shook public confidence in the nation's securities markets. Also see Wikipedia article. Securities Lawyer's Deskbook - Contains the text of the basic federal securities laws and regulations, as well as links to the principal Securities and Exchange Commission forms under those laws and regulations. The Deskbook is designed primarily for use by legal practitioners and scholars, securities professionals, and corporate officers. ShovelWatch: Investigating the American Recovery and Reinvestment Act of 2009 - A joint project of the non-profit investigative journalism organization ProPublica, The Takeaway and WNYC Radio investigating the proposed American Recovery and Reinvestment Act. SIFMA Quality of Execution Reports - Market sector statistics and key trends in the securities industry. Special Drawing Rights (SDRs) - The SDR is an international reserve asset, created by the IMF in 1969 to supplement the existing official reserves of member countries. SDRs are allocated to member countries in proportion to their IMF quotas. The SDR also serves as the unit of account of the IMF and some other international organizations. Its value is based on a basket of key international currencies. Today, the SDR has only limited use as a reserve asset, and its main function is to serve as theunit of account of the IMF and some other international organizations. The SDR is neither a currency, nor a claim on the IMF. Rather, it is a potential claim on the freely usable currencies of IMF members. Holders of SDRs can obtain these currencies in exchange for their SDRs in two ways: first, through the arrangement of voluntary exchanges between members; and second, by the IMF designating members with strong external positions to purchase SDRs from members with weak external positions. Also see Wikipedia article. SWIFT (Society for Worldwide Interbank Financial Telecommunication) - Messaging platform, products and services that connects more than 11,000 banking and securities organizations, market infrastructures and corporate customers in more than 200 countries and territories. Enables its global community of users to communicate securely, exchanging standardised financial messages in a reliable way. Also see Wikipedia. TDAmeritrade - Discount brokerage Ameritrade offers a powerful marketplace to the investing public with its combination of value-added service for customers and low pricing: Internet trades, touch-tone trades, and broker-assisted trades. Ten-Year Treasury Constant Maturity - An index published by the Federal Reserve Board based on the average yield of a range of Treasury securities, all adjusted to the equivalent of a 10-year maturity. Yields on Treasury securities at constant maturity are determined by the U.S. Treasury from the daily yield curve. That is based on the closing market-bid yields on actively traded Treasury securities in the over-the-counter market. Investors and those following the movement of interest rates look at the movement of Treasury yields as an indicator of things to come. Their rates are considered an important benchmark: Because Treasury securities are backed by the full faith and credit of the U.S. Treasury, they represent the rate at which investment is considered risk-free. Also see Series: DGS10, 10-Year Treasury Constant Maturity Rate, published by St. Louis Federal Reserve, this description from Swivel, and yet another from CBO. TIAA-CREF - A leading financial services organization, a major institutional investor, and the world's largest retirement system. Quarterly position and transactions data on financial derivatives. USAID - Independent government agency providing economic development and humanitarian assistance. U.S. Inflation: Measuring Inflation - Information provided by the Federal Reserve Bank of Cleveland. U.S. National Debt Clock - U.S. national debt calculated in real time. Overview and FAQs regarding the national debt. UN Network in Public Administration Network (UNPAN) - Serves as a portal in public administration and finance throughout the world. Provides information, advisory, training, conferencing and directory services for its users in the areas of public economic policies, institutional buildings, civil service/public sector reform, management innovation and development, public finance. Vanguard Group - One of the U.S.' largest mutual fund organizations. Wall Street and Technology - A leading information portal for the financial technology marketplace, allowing traders, investment advisors, analysts and IT professionals to track the latest developments in IT that impact the capital markets. Wall Street Money Machine - Enticed by profits and bonuses, Wall Street took advantage of complicated mortgage-based instruments to reap billions, only to exacerbate the eventual crash. A ProPublica series. Who's Behind the Financial Meltdown? - The top subprime lenders whose loans are largely blamed for triggering the global economic meltdown were owned or bankrolled by banks now collecting billions of dollars in bailout money - including several that have paid huge fines to settle predatory lending charges. These big institutions were not only unwitting victims of an unforeseen financial collapse, as they have sometimes portrayed themselves, but enablers that bankrolled the type of lending that has threatened the financial system. These are among the findings of a Center for Public Integrity analysis of government data on nearly 7.2 million "high-interest" or subprime loans made from 2005 through 2007, a period that marks the peak and collapse of the subprime boom. The computer-assisted analysis also reveals the top 25 originators of high-interest loans, accounting for nearly $1 trillion, or about 72 percent of such loans made during that period. Working Group on Financial Markets (aka President's Working Group on Financial Markets, the Working Group, and colloquially the Plunge Protection Team) - Created by Executive Order 12631, signed on March 18, 1988 by United States President Ronald Reagan. The Group was established explicitly in response to events in the financial markets surrounding October 19, 1987 (Black Monday) to give recommendations for legislative and private sector solutions for "enhancing the integrity, efficiency, orderliness, and competitiveness of [United States] financial markets and maintaining investor confidence". World Bank: Mapping for Results - Mashed up Google Maps with World Bank data to give you a visual entry point to browse its projects, news, statistics and public information center by country. World Check - More than 3000 institutions, including 47 of the world's 50 largest banks and 200 plus enforcement and regulatory agencies, rely on the World-Check database of known heightened-risk individuals and businesses to efficiently screen their customers, associates, transactions and employees for potential risk. This highly-structured database is updated daily in real-time by World-Check's international, research team and is derived from hundreds of thousands of public sources. Yahoo! Finance: Financial Glossary - Glossary of financial terminology. This webpage last updated on Saturday, December 15, 2018 9:10 AM.